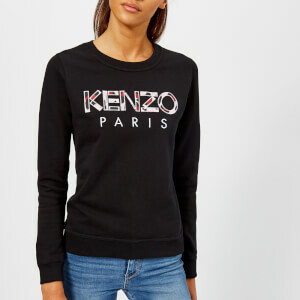 Women’s ‘Eagle Writing’ jumper from Emporio Armani. Cut with an ultra-soft cotton blend, the pink sweater features a ribbed crew neckline with ‘V’ insert, ribbed cuffs and a black velvet ribbon tie at the hem. A half-embroidered, half-printed ‘EAGLE’ slogan across the chest adds the finishing touch to the design.